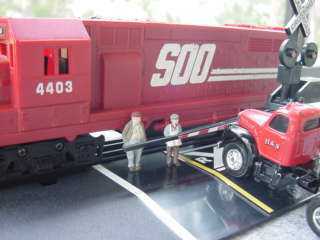 Ertl farm train (Loco) and Ertl semi. The crossing gate is part of the farm train set. This little van was in a box labeled " Atlanta1996 Olympics" . It is labeled 1956 Melbourne Olympic Games" This 1/64th car and 12 pit guys is called "Winners Circle" I got it for $5.